On trip in Portland somebody told me that I couldn’t leave without seeing the Prenatal Exhibit at the Oregon Museum of Science and Industry, or OMSI. The exhibit was created by Dr. Gunther von Hagens, the person behind the controversial “Body Worlds” exhibit. He uses a plastination technique to preserve animal and human bodies and sets up exhibits in an effort to educate people about anatomy in a way that books can’t. The exhibit is controversial because in the case of the human bodies, these were real people who arguably should have been buried. My staff and I have unresolved concerns about that aspect of it. The BODY WORLDS exhibitions rely on the generosity of body donors; individuals who requested that, upon their death, their bodies could be used for educational purposes in the exhibition. All the whole-body plastinates and the majority of the specimens are from these body donors; only some organs, fetuses and specific specimens that show unusual conditions come from old anatomical collections and morphological institutes. I found a few images online of the exhibit that I’m going to include with this blog post to try to give you a visual of what we saw, but I firmly believe that these pictures don’t do the exhibit justice. I’ll explain why later in the post. Before you get to the main exhibit, there are lots of walls set up with some of Lennart Nilsson’s famous fetal development pictures and explanations of human development. My favorite area was an interactive display where you could push different buttons and LED lights would illuminate how the babies blood and the mother’s blood is kept separate, yet the mother’s body gives nutrition to the baby and carries away waste. 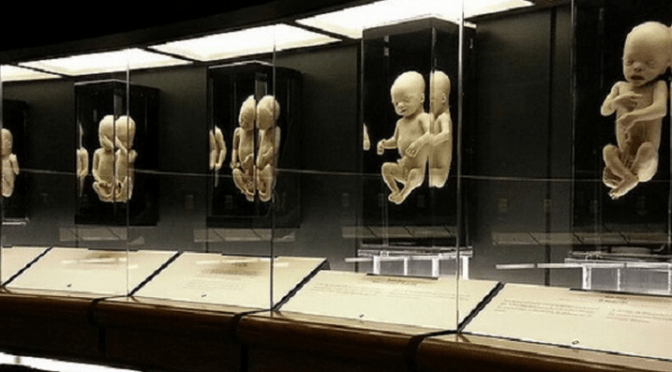 There are 42 embryos and fetuses preserved in glass cases along the curved wall. They start at the youngest and as you walk through the exhibit the babies get progressively older, until you reach the last child who was 33 weeks old and had a full head of hair. My immediate emotional reaction upon entering the room was sadness. There was a seriousness to this room, and the design of the room was clearly intended to underline the seriousness of the exhibit. This isn’t a place to let your kids run free like they can at some of the other sections of the museum. The youngest baby was only a few weeks old, and was very small. I took my time, spending several moments in front of each child. As I looked at the youngest embryos, I thought to myself that I could understand why a pro-choice person could see this part of the exhibit and still feel convinced that these early embryos aren’t morally significant. I certainly think they are, but it’s not because of the way they look. It’s because of what I believe about the nature of all humans, including the youngest of us. It became harder for me to step into the shoes of a pro-choice person and defend abortion rights later in the exhibit though. Around the point where the baby in front of us was nine weeks old, it became clearer than anything that this is a little human, not an unorganized mass of developing tissue. We didn’t just feel angry about the late-term babies either. As I glanced to my left at the first-trimester babies, I thought, “These babies can be legally ripped to pieces, and they are, to the tune of about 3,300 every day.” At Equal Rights Institute it’s a priority to us to be very careful with philosophy, and understand why the most philosophical pro-choice advocates believe what they believe. And yet, staring at these children, I felt like I live in a society that has gone mad. After I reached the end of the exhibit, I walked back to one of the babies. It was the one who died at 10 weeks. Many people don’t know that my wife and I lost a child 10 weeks into our first pregnancy. It is the most traumatic thing we have ever experienced. I felt like I needed to take this opportunity to remember my first son or daughter. So I stared at the 10-week child for several minutes, in silent memoriam. His body was longer than I expected a 10-week child to be. And as I stared at him, I felt like I connected with him a little. I once had a child, and he or she was alive while we were ecstatic about our first pregnancy. For the first few years of our marriage we weren’t sure we could get pregnant, and then we finally did, and I was so excited I would literally jump up and down when I told people! And then our child passed away, and a small part of me died with our child. I’ve never been the same. We quietly left the exhibit, walked to our car, and processed together. We talked about the difference between the babies who were eight weeks and younger, and those that were older. We agreed that it is equally sad that they all died, but we had more sympathy for pro-choice people who only defend early abortions than those who defend all abortions. Having said all of that, we agreed that while abortion remains legal, though we have reservations, we would prefer if an exhibit like this was in every major city in America. This exhibit humanized the unborn more than Lennart Nilsson’s fetal development images or the graphic abortion images do, both of which we use in our outreach brochure. There are some pro-choice college students whose world would be rocked if they saw this exhibit, in a way that images don’t rock their world. Why? Because in this exhibit you’re in the personal, physical presence of unborn children. Jacob agreed that an exhibit like this is necessary for our society to see, but he wished it wasn’t. As a full-time pro-life advocate who thinks about abortion a lot and tries to persuade others to become pro-life, I have sometimes struggled with how to balance grief in my pro-life work. There are some days that I don’t feel as sad about abortion as I ought to. There are two extremes I need to try to avoid: If I’m grieving all the time, it’s unhealthy, but if I never grieve, I’m disconnected from just how awful abortion is. I think seeing this exhibit helped me get a little more balanced on how grief should interact with my work.